I was putting away clean laundry the other day and realized that my collection of dress socks–which I grant you is not uncommonly extensive–is now about fifty percent hand-knit. That's a respectable total, I think, especially considering my tendency to over-think knitting projects in general, and socks in particular. After a recent speaking gig somebody asked me, "Do you swatch?" and I replied that it sometimes feels like I never do anything else. Those Looking Glass Socks I wrote about a few entries back, the ones made from Supreme Possum, are a perfect example. I fussed and fussed and cast on and knit and ripped back and cast on again and ripped back again and broke out the colored pencils and doodled on napkins and Googled "Fibonacci" and created charts in Illustrator and stared at the wall and bent the ears of several persons willing and unwilling. I wound up with this. I'm happy with it. It's fine. It may even be cute. But after all the exertion I keep thinking of a favorite anecdote from one of my culinary idols, Madeleine Kamman. In When French Women Cook , Madeleine tells of slaving for hours in the kitchen over a new dessert intended to impress the chef to whom she's been apprenticed. The chef looks at the finished dish, tastes a spoonful, and says, "Congratulations, chérie. You have just re-invented Nesselrode Pudding." After all that effort, it does seem one might have come up with something more revolutionary than 2-4-2 stripes, doesn't it? On the other hand, just at present I need a bit of plain vanilla. When I have an odd moment to knit, I can pick these up and knit. No charts to consult, no maneuvers that can't be accomplished on a speeding bus, no passages that preclude conversation. There's something to be said for that. pretending the ugly color jog didn't matter if I kept it at the back of the leg. The other three were various sly tricks figured out by knitters far smarter than I. I ultimately settled on the jog-less jog Meg Swansen sets forth with characteristic brilliance in Handknitting With Meg Swansen . I'm not going to explain it here, because it's Meg's technique and not mine. And for heaven's sake, the book is cheap, amazing, and readily available. If you don't have a copy, you should get one. I will show you how well it worked. Here's the foot, with the spots where the color jog would be in plain view. Here's the path of the jogless jogs. As you can see, Meg's maneuver (which I can perform, but still not comprehend) causes the first stitch of the round to travel one stitch to the left each time it's performed. 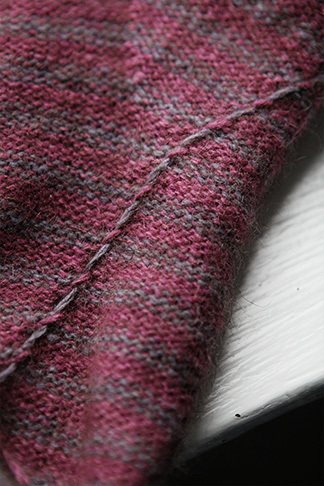 Here's how it looks on the inside, with the unused yarn being carried up a short distance between stripes. Maybe, just maybe, if I keep fiddling and dawdling, I'll eventually come up with such a fabulous contribution to the field. Or maybe I'll be 96 and still knitting freaking stripes. Time will tell. Ironically, while I've been doing this very unremarkable work I've also been preparing a reward for those who have completed extremely remarkable work. It's the Gold Medal for Yarn Harlot's 2010 Knitting Olympics. If you like it, you can get one of your own here, or snag sidebar- and Ravelry avatar-sized versions from Stephanie's blog. A big ol' salute to everybody who took part, including Harry, who finished his animal blanket with time to spare and didn't even care when Dolores told him the cow looked like an elk. Talk about timely! I am knitting a striped sweater (top-down raglan) and a pair of striped socks. I was able to hide the jogs in the raglan seam, but my other tricks for hiding jogs don't seem to be working for me. Good work on the medals Franklin. I just got my Knitter's mag today and there you are again 2 pages in. Quite the celeb aren't you? I think your socks look great and don't you just love love love possum? Beautiful socks! The medal is awesome as well and I have snatched it for my desktop this month. I earned my medal for participating in the Knitting Olympics for the first time (I didn't knit four years ago); thank-you so much for designing it! They are gorgeous! I was thinking of knitting socks for my boyfriend (new-ish relationship, very much in love....) and these are a must! I can barely knit socks to fit my own feet, so trying to fit someone else's will be a challenge. Brilliant--you, the socks, and the Gold Medal. Yes, if you are a knitter, you must own Handknitting With Meg Swanson. I think it's a law or something. They're beautiful, Franklin. And I'll definitely keep in mind that jogless color change. It's nearly invisible if you don't know where to look. Those are darling. When can I expect to receive my pair? Size 13, remember. Thank you for the medal - now I just have to figure out how to put it up on my sidebar in my blog. Also, those socks are ridiculously good looking - all that swatching must have paid off somehow. Beautiful work on the socks! And a handsome medal. 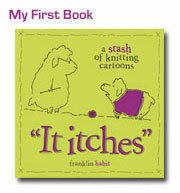 Will it ever be available with the caption "Runs with knitting needles"? Thanks for your post, Franklin. I've read about the jogless jog and am now off to buy a copy of Meg's book. The socks are so lovely. I think I shall be knitting a pair of striped socks very soon! I keep trying to convince myself that the dark halo around those socks is contributed by the possum, not your leg hairs. Mind you, not everyone else was dealing with hordes of rugby players requiring bandaging/hand holding-while hip dislocated/nosebleed staunching/ice packs etc on the first weekend. Six teams, six matches... pratically deserves a medal on its own. Mind you, I bet they didn't make a sleeve that was 8 stitches too wide either (which was the absolute killer of the Olympic Dream). We all need a simple sock for mindless work when the brain just can't function anymore. Yours are lovely. Thank you for designing our medal. Thanks so much for the perfect medal! It's on my Ravelry project page. I did not use a jogless jog technique in my olympic sweater. I went with option 1.
wow, as usual, that is beautifully photographed. Beautifully knitted too. I don't know if you read my post about my sampler stole, I was hoping or wishing you would photograph it. It is so beautiful and I just don't know how to take a good picture. go look and tell me what you think. as far as the jog, look at my new pattern in knitters, there's some jogless jog striping for you!! 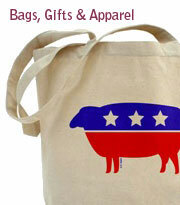 As they say in the South (and in parts of Indiana) - "I gotta get me some of that possum!" The socks are beautiful, I bought the book, and got the medal for my not-as-wonderful-as-your-socks olympic shawl. 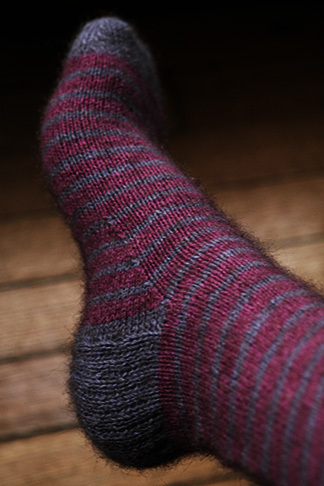 I love the sock with its stripiness even if you reinvented the wheel to do so. It's the perogative of perfectionists to do things the hard way after all! Well, I agree with Moorecat : the socks are gorgeous, but the halo is a bit... disconcerting. But they do look awsome to wear. I am not sure that I will knit possum myself, though. As Mies van der Rohe, Buckminster Fuller, and Robert Browning said, "less is more". You nailed a classic! Don't tell me you made the other one the same! After all that angst, you could have done your Tweedle Duh socks! The stripes are beautiful though. Perhaps you know best. Thank you so much for designing it. Sometimes you just have to not think about it but knit it...profound,eh? The socks turned out beautifully as I knew they would. They must feel unbelievably soft while wearing them. Lovely stripes! Also love the Addi ad of you and your lace knitting. Thanks for designing such a great medal, and sharing it with all of the Olympic Knitters. I'm so happy to have it on my blog. Tell Harry that elk is good. It was, after all, the Canadian Olympics. As for your socks, they're gorgeous, but could you please post a picture of the cuddly downunder opossum? I looked at the socks and kept seeing that nasty faced critter you showed when you displayed the yarn and at the time of the sock kick off. Ugh. The extreme neatness of your socks do entirely make them remarkable knitting. Some got it, some don't - neatness, that is. It's the fuzzy possum that makes them cute. I LOVE the colours of the socks, and am very impressed by your jogless stripes, the technique for which I am just about to attempt in my own pair of socks. I also like the 2-4-2 stripe: very snazzy! I used that method for a top and it worked well. Pondered it on socks but was undecided. 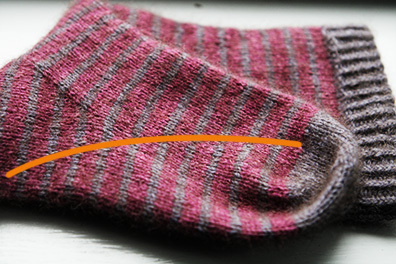 Can you feel the bumps of the unused yarn on your foot? Just got VK and stumbled upon The Ad. That is what I call rockin' the needles. Going to buy a bulletin board so I can pin it up! I can't find the quote!!! Something if if it does not seem carelessly wrought, then all your handwringing will be for naught. I love your Possum Socks. They look very cozy. I love the Vogue inside cover! congrats! So, I return appropriately humbled. I tried some two colour knitting. That jog thing you have done is a Work of Art. I take it back about the other sock and the idea it be different than this sock. Please forgive the arrogance of my ignorance. Apparently, when my mother or I work on an essay or project, it looks to my Dad like "an elephant giving birth to a mouse". Lots of huffing and puffing and fuss with a surprisingly small result. I like to think we are doing all the rewrites internally, as said "mouse" will require very little editing. Fortunately, he is much more impressed with my knitting than with my composition techniques. The stripes are very nice though. I've been working on my first pair of socks since Christmas - almost done with the second one now. welcome to Greenreplica.com,it provided Lots of low price but high quality including Nike Air Max,Air Max Shoes,Air Max 90,Nike Air Max Shoes,Cheap Nike Air Max,Air Max Nike,Wholesale Nike Air Max 2009,we have thousands of Nike Air Max and Air Max Shoes Wholesale.